I've teamed up with Misa Masa! We've split our swatches in two for this collection. Check out Misa Masa's half of the colors here. She's a great blogger with a bit of a Misa obsession (and believe me, Misa is something you *should* obsessed with) and some great swatching and reviewing abilities. A Sunny Smile Makes Me Go Wild. A super-bright highlighter yellow. It may not look like it in the picture, but it's the exact burn-your-retinas bright yellow shade as a highlighter marker. Similar to Chine Glaze Celtic Sun, but less of a jelly finish. This is thick and a little streaky, not exactly easy to apply. For some reason this happens with all bright yellows and I have no idea why. Hot People Like You. Bright neon pink with a purple/blue reflection and a touch of shimmer. Unlike other neons, this one doesn't dry to a chalky finish. I left the second picture huge so you can click to see the shimmer up close. Pour Me Something Tall And Strong. Hey, that's my motto. A gorgeous bright Crayola blue that's perfect in every way. This is my new favorite blue polish. 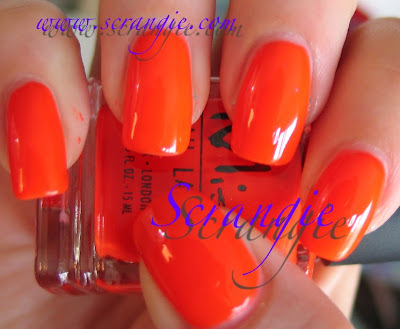 It reminds me of OPI Dating A Royal, but brighter and more vibrant. Like Rescue Beauty Lounge Dead Calm's baby sister. Sandals, Flip Flops and Hip Hop. What do you know, three of my least favorite things all rolled in to one convenient package! Hahaha. Name aside, this is a gorgeous color- hot glowing corally medium pink- a deeper, more saturated hot pink. Very, very bright and beautiful. Six-Pack Summer. Very bright neon orange. Like neon-orange spray paint. Very smooth and easy to apply. Definitely a shocking color! Maybe the Misa is a bit more green than the China Glaze, but still pretty darn close! And here are the neons all together, because they look so much better when they're all next to each other. It increases the awesomeness by 500%! I love this collection a lot. These aren't just neons; they're innovative neons. They aren't the gooey, chalky neons I'm used to. They're smooth and thin, dry just as quickly as their chalky cousins and have a little bit of an edge to them. They're not all creme, there is some shimmer to a few of them. Shimmery and neon? Hell yeah! Thanks guys! Some look a little sheer tho, is that true? Cause I can see your nail thru them...? Non-chalky neons? For serious? I had a look at Misa Masa's swatches and I can feel a purchase coming on. Great timing, too, for a summery bright collection to come out in time for an Australian summer. I know that wasn't their intention, but I choose to think it's all about me. I want that blue so much I can hardly stand it. I LOVE your description of the yellow Misa--so funny!!!! You are right, that blue is da bomb! Oh yeah! I'm getting a few of these, even though they feel a bit too summery for me. Pour me something tall and strong is gorgeous! It looks a bit transperent though? How many layers did you do for the picture? The Grass is greener on the other side is FAB. I MUST have it. NOW, preferably! 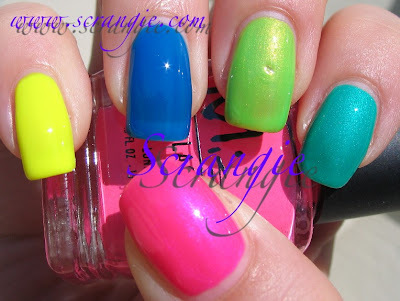 <3 Neons!! Thanks Scrangie & thanks so much for comparing TUT, It's green enough to be different in my book! I love turqouise!! Holy frijoles!! I LOVE THESE!! I have a brand new 22inch widescreen monitor at work and when I looked at this post this morning I was almost blinded :) I have to have these. Today is payday as well... :) Thanks for GREAT job, as always! Oooh, I'm so looking forward to see these popping up on H2T, which will be soon. Hopefully at the same time as the CC! I want groove thang, but I have to order them at the same time. Otherwise it'll hurt my wallet! I really want, I have to be careful with my money. Boring huh!? "Pour Me Something Tall And Strong" )love the name **lol** and the grass is greener on my side!!! a little late in the game for neons. not interested in any. Guess which two I must have! Maybe I need them all, but definitely Pour me Something... and Grass is always greener. Mmm!! I'm not usually one to like neons, but Hot People Like You is very mesmerzing, for some reason. The reflection is amazing...it really reminds me of neon lights!! Great swatches!! Ane Kristine, hmmm, you may be right. In the picture I'm wearing the old formula one, but I also just bought a bottle of the new formula one (black label) and they do look different! I have that problem with Purple Panic, too, mine is light pink and everyone else's seems to be purple! *sigh* Thank you for pointing that out! Very strange, indeed! 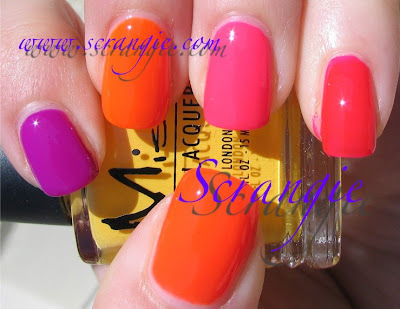 Sminkan, those are seriously hot colors, and I know you'll rock them!! Oh hog-wash! Now I know I need the pink one because it looks like Essie disco pink to me. Nine New OPI Designer Series Shades!